Here you will meet many dogs who are waiting to be chosen to be part of your family. Maybe you have never adopted a rescued dog or maybe you are experienced in the world of animal rescue, but whatever the case we're glad you found us. Adopting a dog that has lost his home is an extremely gratifying experience. Every year over 8,000,000 pets are destroyed because no one wants them. We try to match some of these unfortunates with people who will open their hearts to them and give them a loving home. If you are ready to take this step, we are here to help homeless, cast off, abandoned dogs find you. Words can't say how much we miss you Manny, but we know we will see you again. That day in 1994 when you came out of the woods begging for help, dirty and starving, and jumped in my lap, you caused a ripple effect that reaches far beyond that day in the outerbanks of NC. 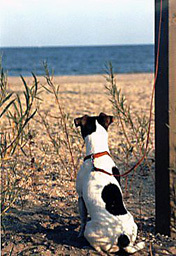 For us you were the beginning of saving many Jack Russell Terriers. 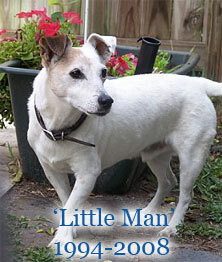 You were the first of the long line of abandoned, cast off, unwanted little JRT's. We will never be able to thank you enough for all you brought to our lives and to the lives of the many little terriers that have passed through our home on their way to their forever homes. We could have never been able to imagine the joy you gave us. Thank You, God for sending this LITTLE MAN to live with us. We will try to live up to the standard of loyalty and love that he brought to us. Until we meet again at the Rainbow Bridge...MaryLu and Alex Kinlaw. 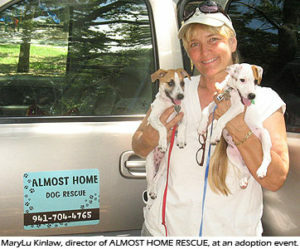 Almost Home Rescue, a 501(c)3 non profit organization, was created to help rescue the many Jack Russell terriers and other dogs in shelters across Florida that need homes or will be euthanized. We predominately rescue Jack Russell terriers because there is such a need and not many rescues are willing to work with them, thus so many beautiful pure bred Jack Russell terriers are left to die in kill shelters. At Almost Home Rescue we take them out of the shelter, have them spayed or neutered, bring them up to date on all their vaccines and they also get a microchip so they will, hopefully, never be lost. Then we put them into a loving foster home where they can live until they find their forever home. http://4marchforth.com/for-the-spirit-god-gave-us-does-not-make-us-timid-but-gives-us-power-love-and-self-discipline-2-timothy-17/index.php?adclick=7 my sources IF YOU WOULD LIKE TO BE A FOSTER FOR A HOMELESS DOG, PLEASE CONTACT US. WITHOUT FOSTER HOMES WE CANNOT SAVE DOGS FROM DEATH IN THE SHELTERS. FOSTER HOMES ARE THE LIFELINE OF RESCUE! To begin the process of adopting a dog from Almost Home, fill out an adoption application by clicking on ADOPT at the top of the page under the picture or scroll down and click on the ADOPTION APPLICATION link at the bottom of the page. It's a simple form - you just type in the answers in the blanks and then hit SUBMIT at the bottom of the form. That will send the completed application directly to us to be reviewed. If you have any problem with the form feel free to call and we will talk you through it. If you don't hear back from someone within 24 hours, please call and ask if we have received your application, as the internet isn't completely foolproof, and we wouldn't want to miss the opportunity to help you adopt a dog! The next step is for a volunteer to schedule a home visit. This is for verification of the fence safety and security for the dog. We like to meet your family and your pets in person to match the right dog with the right family. We hope you understand that we at Almost Home only want the BEST for every dog that we adopt into a home and we try to choose the BEST home for each dog.